Sounds pretty exciting, right? And, as Christians we should be excited to think that the book of Acts will be presented on prime time television so that many who have never even read the Bible can see the amazing things that happened after the Holy Spirit filled the apostles with boldness to preach the gospel fearlessly! What a contrast to how they had been hiding in fear behind locked doors as John 20:19 reveals to us! Well, to answer those of you who may have that question, I am presenting you with a lot of information to make you all realize, once again, the extreme importance of praying for discernment and the need for us always to test not only the things that people say and do who claim to speak for God against the truth of His Word, but also the importance of testing what we read and hear against the truth of God’s Word. We can’t just accept something wholeheartedly based on the fact that our pastor, or a certain teacher who might be highly respected by many, may be promoting something or someone. 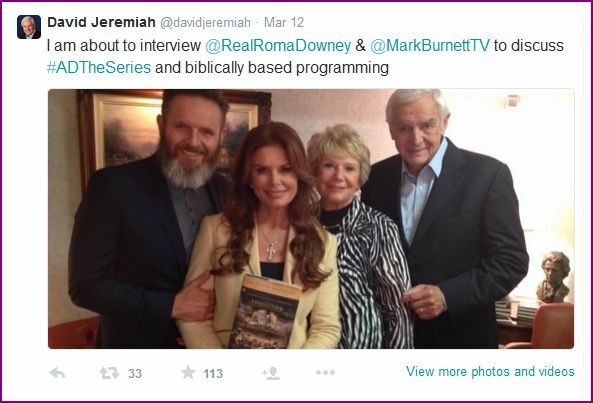 1) Roma Downey is a devout Roman Catholic who prays to Mary. 2)Roma Downey graduated from USM, University of Santa Monica, which is a New Age Metaphysical school. I encourage you to watch the two part video series above or read the article at the link above so that you can learn many even more alarming things concerning Roma Downey. I also ask you to please pray for Roma, as well as for her husband, Mark Burnett, that they might both come to the knowledge of true Biblical Christianity and who Jesus Christ truly is as God’s Word reveals Him to be. I am saddened and shocked to see the lack of Biblical discernment among prominent pastors and teachers these days! I realize that many pastors are overloaded with responsibilities, but that is no excuse for them to endorse something without testing it against the truth of God’s Word. I saw the need to write this post to, once again, stress the importance for all of us who are Christians to follow Jesus Christ alone. We as Christians must think for ourselves and not accept anyone’s endorsement of another pastor or teacher, or a program, book, movie, etc., without checking everything out for ourselves first and praying for discernment as we test everything in light of Scripture. What a person believes will have a strong influence on what they write and produce. 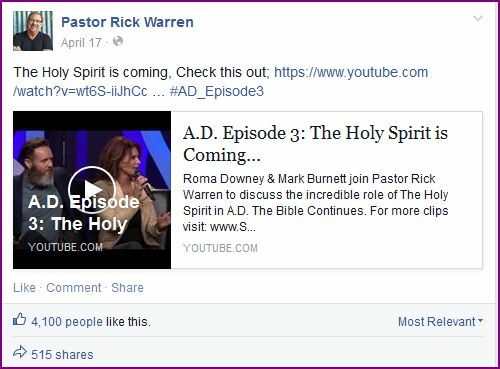 Yes, we much leave room for artistic license, but if you take the time to read all the reviews and articles, and watch the videos that I posted below for you, you will come to the realization, along with many other Christians, that Roma Downey and her husband, Mark Burnett, are presenting another Jesus and another gospel; a Jesus and a gospel that easily appeals to all religious faiths –except for true Biblical Christianity in many respects. 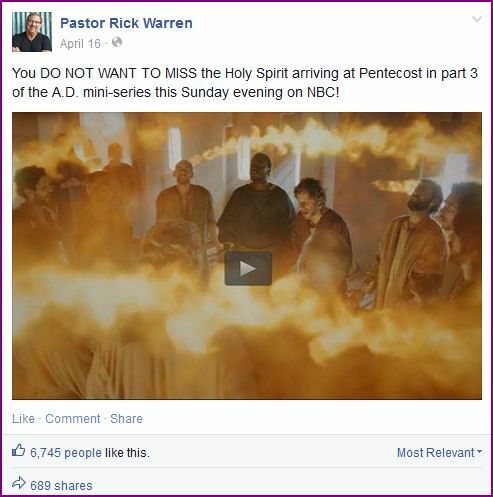 As Christians, we can, however, watch programs like these and use them as opportunities to not only become Bereans by testing the content against the truth of God’s Word to see if what is being said is true (Acts 17:11), but also we can use them as opportunities to begin conversations with other people who are watching these programs. Whether they are unbelievers, or Christians who have not come to realize the importance of reading and studying God’s Word on a regular basis and therefore lack the discernment necessary to know truth from error, we can simply begin by asking people if they watch these programs, and, if they do, we can ask them to share their thoughts with us about them. Then, if we discover that they truly enjoyed these programs and they don’t express any concerns about what important things were missing, and what was added that caused them to be concerned, then we will know that we need to pray for God to give us wisdom on how to respond to their comments. With humility and gentleness we can then begin by pointing out some of the truths and amazing things that are in Scripture that we noticed were missing from what was portrayed in each episode, as well as the problematic things that were added that could lead people away from having a true understanding of who Jesus Christ is and what the good news of the gospel is, as well. I hope you are learning — along with me — the importance of not only thinking for yourself and searching things out, but also the extreme importance of testing everything against the truth of God’s Word so that you will never be deceived. For those of us who not only have come to an understanding of our sinfulness and God’s righteousness, but also have come to the point of putting our complete trust in what Jesus did when He willingly died in our place for our sins and we no longer place our trust in our ‘good works’ hoping to earn God’s forgiveness and love, our hearts are filled with gratefulness –especially at this time of year. When we realize that Jesus — God in the flesh — willingly allowed God, His Father, to pour out His wrath intended for us because of our sins upon Himself, it causes us to stand in awe and amazement at His love and undeserved grace and mercy! 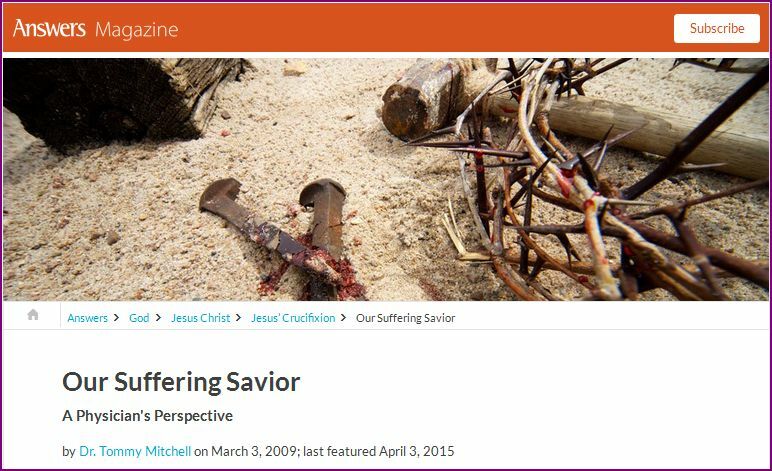 And as much as we may have a renewed appreciation for His willingness to die for us, and even though we may greatly rejoice in a deeper way on Resurrection Sunday for what He accomplished for us, oftentimes many of us don’t take enough time to reflect upon the excruciating pain that Jesus willingly endured on our behalf for our sins that once condemned us and separated us from a completely Holy God. 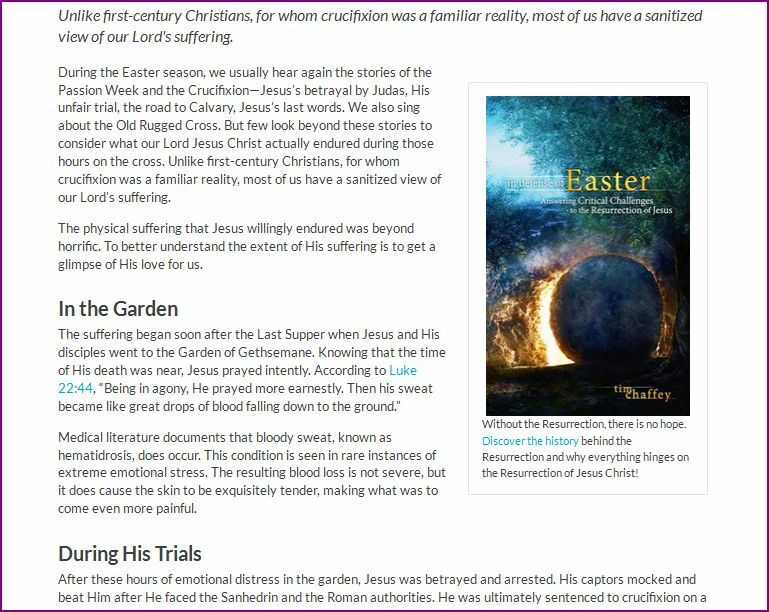 Around seven years ago I watched a video of a physician who explained in great detail the effects of crucifixion on the human body, thus revealing the unimaginable pain that Jesus must have gone through when He was crucified. 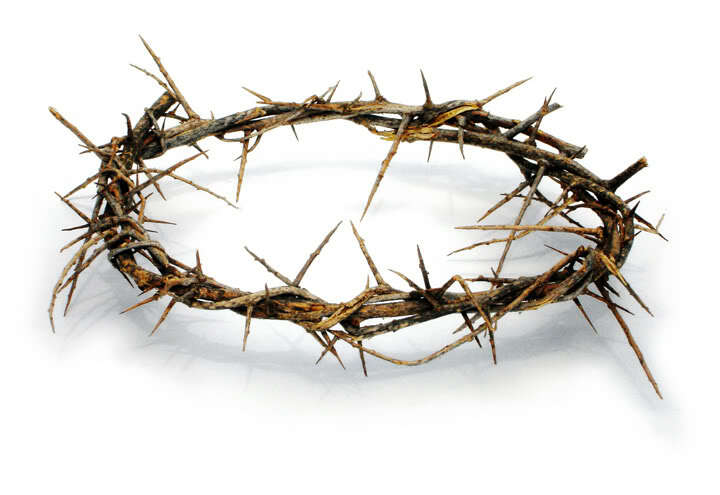 It made me realize just how much Jesus suffered on my behalf to pay the debt for my sins. So today when I saw the following article that was posted by Ken Ham of Answers In Genesis I decided to share it with you hoping that it would cause your love and appreciation for what Jesus did for you to grow deeper, as well. When time allows, I hope you’ll consider taking some time to continue reading this deeply thought-provoking article, and I hope and pray that God will move upon your heart and give you a better grasp of the depth of the love that God has for you. For those of you who have not yet come to the understanding of your need for a Savior, I pray that ‘God’s kindness will lead you to repentance,’ and that one day you will place your trust in Christ alone for your salvation and come to know the love, forgiveness, mercy, and grace of God, as well. Please remember that only reading God’s Word can reveal His truth and His love to you, and ‘faith comes by hearing God’s Word’ (Romans 10:17) and not by having ‘experiences,’ but I thought that this article, as well as the many Scriptures I also posted for you, would be perfect to share with all of you today. From the Garden of Gethsemane to His last moments on the cross, Jesus — God in the flesh — took God the Father’s wrath intended for us because of our sins upon Himself, and died in our place. Is your trust in what you do, or have you placed your trust in what Jesus has already done for you? Thank you for stopping by. And thank you very much for taking some time out of your busy day to read some of my posts and poems. God bless you. Scriptures taken from The Holy Bible New International Version® 1973, 1978, 1984 International Bible Society Used by permission of Zondervan. All rights reserved. For those of you who are Christians and you’re finding yourself struggling with the decision if you should or shouldn’t go and see Darren Aronofsky’s ‘NOAH,’ I thought I’d post this live movie review (at least it’s ‘live’ at the time I’m writing this) and other videos and links to articles concerning the ‘NOAH’ movie that I thought might help you make your decision. There are many conflicting reports out there, some even given by popular Christian leaders. However, because I know Ken Ham and those he chose to be a part of this review panel will give you a very Biblical and accurate review, I am hoping that by watching this review, as well as watching the other videos with very Biblical information that I posted for you, that you will then finally be able to make your decision. If you do decide to go and see it, you will then know for yourself who has given the most honest and accurate review. Yes, they were given artistic license, but they claimed to stay true to the Biblical text. And according to the many who have seen it, as you will see from the information posted below, that is simply not true. We live at a time, as the Bible declares, when many scoff at the idea that Jesus will actually return, and many also choose to believe in the theory of evolution as a fact. We also live at a time when everything that God calls evil, many now embrace as acceptable and normal. And that describes exactly what the Bible says will be man’s thoughts and behavior right before Christ returns! Time for everyone to think about their eternal destiny and to take God at His Word and repent, because tomorrow is promised to no one! God bless you, and thank you for stopping by. And thank you also for taking time to read my posts and poems. Scriptures taken from The Holy Bible New International Version®1973, 1978, 1984 International Bible Society. Used by permission of Zondervan. All rights reserved. ANY ADVERTISEMENTS THAT YOU MAY SEE ON MY BLOG HAVE NOT BEEN CHOSEN OR APPROVED BY ME; I CANNOT EVEN SEE THEM.